One thing The Chef taught me, was to’ never judge a restaurant by its cover’. I had always thought that working in some of the finest restaurants, he would be picky in where he ate, but in fact he has taught me the opposite. Delicious food can be found in the most inconspicuous of locations, and bad food can also be found in the most pretentious of locations. To be honest, I hesitated before walking through the door as the crowded tables and not-so-glamorous interior looked a little daunting. Though a quick peek inside at the full tables of asian diners quickly put my mind at ease. Another piece of wonderful food advice The Chef has instilled in me is that if you want to eat good asian food, go where asian people go. I was quickly met by the smiling owner and ordered a beef soup. Before I even had a moment to take in my surroundings, a huge bowl of soup bigger than my head was placed in front of me. Another surprise was also brought out, a plate full of fresh mint and a large pile of fresh, cold bean sprouts. It was a feast for the senses. I sat for a moment with the bowl in front of me, simply taking in the aroma of this marvelous soup. 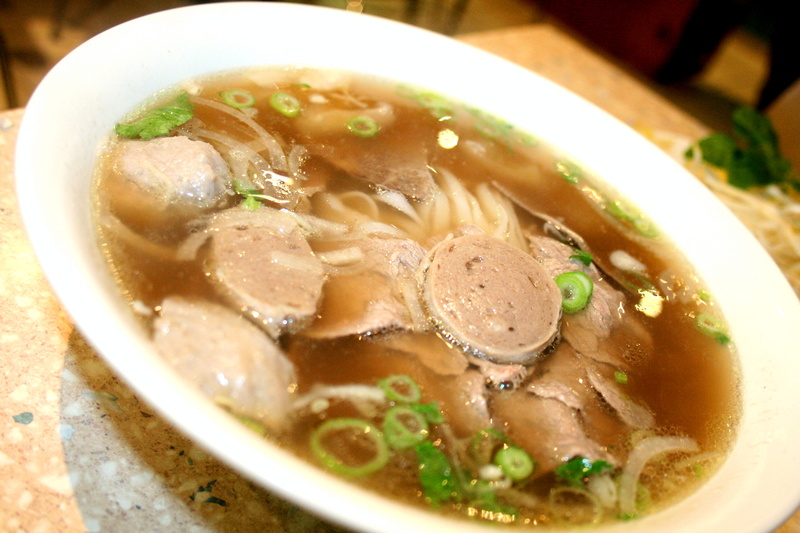 Packed to the brim with clear beef broth, noodles, sliced beef, beef sausage (made in house) and beef balls. I was pleasantly surprised when I finally dived into the soup, and instantly felt at home. This was one of those dishes that just makes you feel good, relaxed, comfortable. I wondered why I was feeling so devine, simply from sipping on a soup and finally put my finger on it. Bone broth. The soup had to be made of bones, and sure enough after asking the owner, I discovered the big pots of bone broth bubbling away in the kitchen out the back. What a fabulous way to eat. Packed full of nutrition, low in fat, fresh herbs, light and tasty. As much as I tried, I couldn’t finish my gigantic bowl of delicious and nutritious soup. It was definately very well priced and fantastic value for money. I was grateful for The Chef’s advice and glad that I didn’t judge AJ Noodle House by its cover. I felt completely satisfied, relaxed and walked out the door with a ‘I’m feeling healthier already’ spring in my step.